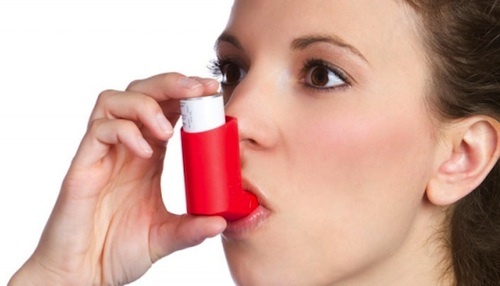 Inhaled corticosteroids are used by millions of asthma patients every day. However, as with all treatments to control asthma, there is marked patient-to-patient variability in the response to treatment. New research published today in the New England Journal of Medicine (NEJM) has identified a genetic variant associated with the response to inhaled corticosteroids . Investigators have found that asthma patients who have two copies of a specific gene variant responded only one-third as well to steroid inhalers as those with two copies of the regular gene. Asthma is a chronic inflammatory disease that affects 24 million people in the United States and roughly 300 million people worldwide . The disease affects the lungs, causing repeated episodes of wheezing, breathlessness, chest tightness, and nighttime or early morning coughing. A number of factors can influence how severely the disease affects people and how well they respond to treatments. In addition to avoiding the triggers that can cause an attack, asthma can also be controlled by taking medication. However, the response to treatment is characterized by high interindividual variability. Poor response to inhaled corticosteroids often runs in families, suggesting that genetics plays a role in how people respond to the treatment. To identify a gene variant, researchers from Brigham and Women’s Hospital and Harvard Medical School analyzed the genetic information from over 1,000 people enrolled in five separate clinical trials evaluating different steroid treatments for asthma. Investigators first conducted a genome-wide scan of the DNA of children and their parents enrolled in the Childhood Asthma Management Program, a multicenter, randomized, double-masked clinical trial designed to determine the long-term effects of three inhaled treatments for mild to moderate childhood asthma: budesonide (a glucocorticoid used daily) and albuterol (a short-acting beta-agonist bronchodilator used as needed); nedocromil (a nonsteroid anti-inflammatory agent used daily) and albuterol; and placebo and albuterol . The scan identified 13 single nucleotide polymorphisms (SNPs) encompassing eight genes, including a variant in a gene called glucocorticoid induced transcript 1 (GLCCI1), which appeared to be associated with poor response to inhaled corticosteroids. SNPs: (pronounced “snips”) are DNA sequence variations that occur when a single nucleotide — A, T, C or G — in the genome is changed, producing different sequences that code for the same gene. These small variations in DNA sequence make up almost 90% of all human genetic variation. Researchers then verified the association in three additional studies on people with asthma, both children and adults. Due to the small numbers of subjects in other racial groups, the analyses were restricted to white participants. The scientists found that people carrying two copies of the GLCCI1 variant were more than twice as likely to respond poorly to inhaled corticosteroid treatment as individuals with two copies of the normal GLCCI1 gene. Those who responded poorly had an average of one-third the level of lung improvement following inhaler treatment as did people with two normal copies of the gene. Approximately 1-in-6 study participants had two copies of the GLCCI1 variant, which is thought to work together with other genetic and environmental factors to affect response to inhaled corticosteroids. Additional studies are needed to understand how GLCCI1 functions in the lungs and to explore whether it contributes to therapeutic response in patients of other ethnic groups. Dr. Jeffrey Drazen, NEJM Editor-in-Chief, said in an editorial that the study brings researchers closer to being able to identify which patients are most likely to respond to treatment from inhaled steroids but that clinical trials are necessary to determine whether knowledge of this information leads to better clinical outcomes . This finding helps to explain the genetic basis for the long-standing observation that some people do not respond well to what is a common asthma treatment. The study illustrates the importance of research examining the relationship between genetic makeup and response to therapy for asthma, and underscores the need for personalized treatment for those who have it. Asthma affects people of all ages, but it most often starts during childhood. In the United States, more than 24 million people have asthma; 7 million of these people are children . For more information on asthma — what it is, its effects and how it is diagnosed and treated — check out the CDC’s You Can Control Your Asthma brochure. Tantisira et al. Genomewide Association between GLCCI1 and Response to Glucocorticoid Therapy in Asthma. Epub 2011 Sept 26. FASTSTATS — Asthma. Centers for Disease Control and Prevention. Accessed 2011 Sep 26. The Childhood Asthma Management Program (CAMP): design, rationale, and methods. Childhood Asthma Management Program Research Group. Control Clin Trials. 1999 Feb;20(1):91-120. Drazen, JM. A Step toward Personalized Asthma Treatment. Epub 2011 Sept 26. NIH-funded study connects gene variant to response to asthma drugs. NIH News press release. 2011 Sep 26.